Hello sir is there any one can tell me How to Apply for Convocation Certificate in Mangalore University? There is no specific process for to Apply for Convocation Certificate in Mangalore University. 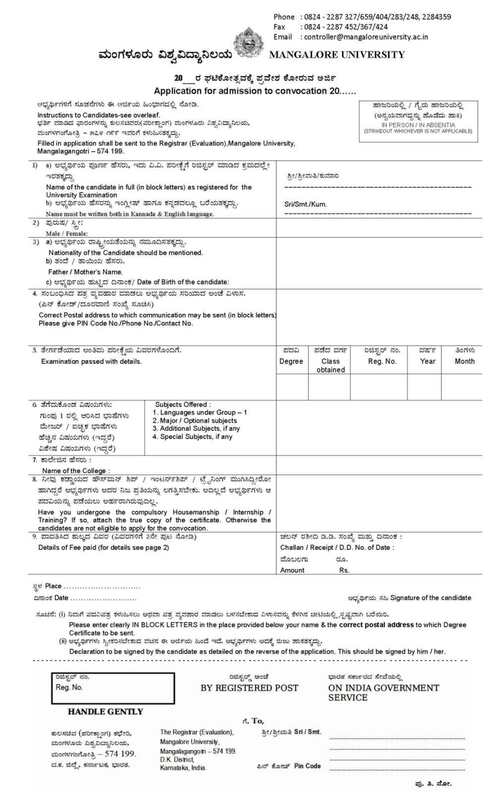 the application form is provides to candidates for Apply for Convocation Certificate in Mangalore University. U.G. Degree	P.G. Degree/Diploma	Ph.D/M.Phil. D.Sc/D.Litt Rs. Convocation fees for SC / ST candidates is 50% of the prescribed fees subject to the production of copy of the certified caste certificate. Hello sir is there any one can tell me How to Apply for provisional Certificate in Mangalore University? Sir,I am from mumbai..i wanted to apply for convocation certificate..can i apply from here..please tell me the procedure..i have downloaded the form...how should i pay fees? I have passed out in the year of 2013, I want to get my convocation certificate, My college name is SDM college Ujire. and total how much fee i need to pay? and now am staying in bangalore, through cheque or DD how i need to pay fees?